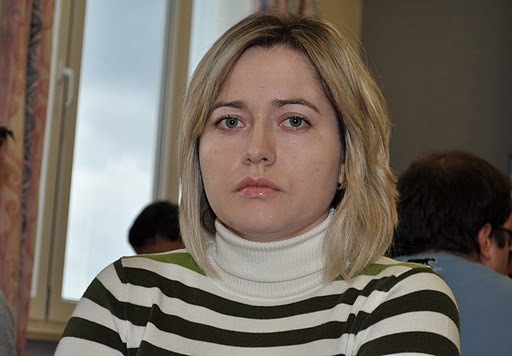 We're pleased to see that of the two ladies playing at the top of the Gibraltar Chess Masters Natalia Zhukova beat GM Edouard (2608), a nice performance by Natalia who seems to be in top form. Read Natalia's recent exclusive interview. Also notable win by Antoaneta Stefanova over GM Siebrecht (2468). In a sisterly battle Humpy Koneru defeated Irina Krush. Nana Dzagnidze lost to GM Sandipan, Anna Zatonskih lost to GM Vallejo Pons (2705), Eesha Karavade lost to GM Geetha Narayanan (2584), Jovanka Houska lost to GM Maze (2554), Alexandra Kosteniuk drew with IM Saravanan, Anna Zozulia lost to GM Hoffmann. There are lots of male GM's in Gibraltar, so there are plenty of opportunities for ladies to show their strength, and we're pleased to see that every day brings male GM victims of women chess stars. All is still possible 4 more rounds to go.